Jack Dracula was the stage name for Martin Semnack who was born on Christmas Day 1935 in Brooklyn, New York. After a stretch in the US Navy he returned to Brooklyn but was unable to find permanent work and started hanging out in Coney Island. In 1954 he got his first tattoo. Jack recounts the story: “One day while I was in Coney Island, I passed Brooklyn Blackie’s tattoo shop. On an impulse, I walked in. On another impulse, I got a tattoo. It was a hinge on the inside of my right elbow. In later years I would tell audiences that it was the hinge on my drinking arm, even though I rarely ever drank. When Blackie finished, he asked me if it hurt. I told him not too much. Then he said that inside of the arm is a rather painful place to be tattooed, and added you were born to be tattooed. As time went on I added to my collection, and in less than a year I had 30 or so tattoos.” This was just the start of a fifty year career as a tattooed man. 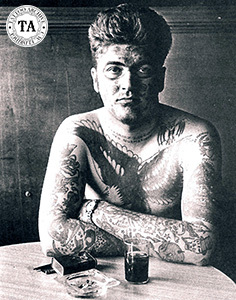 In 1956 he got his big tattooist break while hanging out at the Grecco Brothers shop in Coney Island. 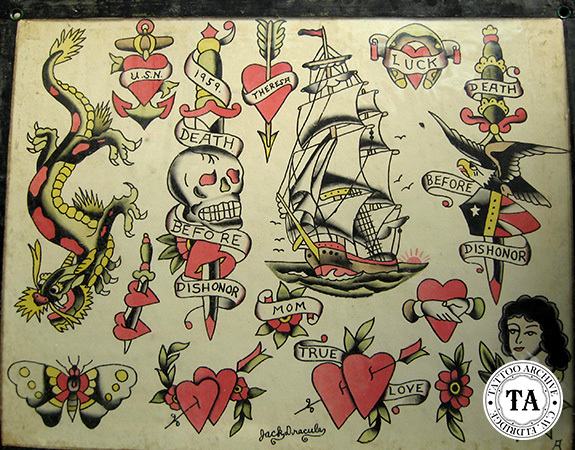 It was a slow night and in a joking fashion Jack said, “I could do a tattoo.” The brothers took him up on it, he passed the test, and shortly thereafter he was tattooing at their shop near the Brooklyn Navy Yard. Dracula is probably best known for his face tattooing. The designs included an eagle on his forehead, cheeks and chin and a mask-like design around his eyes. He started the face tattooing himself but he said that “he could see that it was not coming out right” so he went to either Junior or his brother Jimmy Colantuono to get it straightened out. There are several stories about who tattooed his face. (Michael McCabe’s excellent book, New York City Tattoo, The Oral History of an Urban Art has more information on Jack Dracula). As the years rolled on he got many more tattoos. He is said to have a total of 405 tattoos, including a battle royal back piece by Sailor Barney. In the 1950s and 60s Dracula worked with many tattooists including Eddie Funk, Tom Yeomans and operated shops in Camden, NJ (315 Broadway) and Philadelphia, PA (Race Street). Dracula also worked in the 1960s as a sideshow attraction for Ringling Brothers Barnum Bailey Circus. He also worked at Amusements American Carnival, Dave Rosen’s Wonderland Sideshow in 1957, Riverview Park in 1962, Jerry Lipko’s Shows in 1963, Palisades Park in 1964 and the Huber Museum in New York City. A 1970s news article about Dracula stated that he was a gourmet cook, a certified wine connoisseur and an amateur archaeologist. He was a well-versed opera fan and member of the Mario Lanza Institute. Dracula also had a large collection of antique jade and spoke a bit of Chinese. Diabetes and lung problems forced Dracula to retire in the 2000s and on January 18th, 2011 he died at the Park Pleasant Nursing Home in Philadelphia. We would like to thank Carmen Nyssen and Bob Blackmar for their help with this update.